Sydgeorgien - världens farligaste vatten? A model of James Cooks ”Endeavour” built 2017 by Bjorn Backman. The model is i the home of Arne and Helene next to the model above of Yaghan. Two books have been published about Yaghans circumnavigation via Antarctica. The first one - "Back at the helm" - was published in 2009 and the second one "In the wake of Cook" 2011. The books are sold at Amazon and are available as Kindle ebooks.They are also published in Swedish as papersbooks and ebooks with the titles "Vid nytt roder" and " I Cooks kölvatten". You can also follow the entire circumnavigation in 20 films below or in the Yaghan blog. The films have been watched 600.000 times. For Yaghans Youtube Channel click here. In the wake of Cook - sailing the Yaghan to New Zealand, Australia, South Africa and the Caribbean. Click here to see the all of the films from the circumnavigation 2006-2009. Click here to see all the films from the South Georgia voyage 2016-2017. Yaghan came back to Sweden in June 2017 after a one year South Georgia trip. The voyage was 23000 nautical miles - a lot of sailing for one year. Click here to read an article i Swedish about the voyage. This trip - like the circumnavigation 2006-2009 - followed in the wake of James Cook. He became the first to set foot on South Georgia in 1775. For a short period we thougt about selling Yaghan when we came home. We were a bit exhausted. However we rapidly changed our minds and Yaghan is definitely not fore sale. She is the best yacht for our needs. We have done one circumnavigation of the World, Antarctica, the Chilean Channels, the Med, the Caribbean, 10 Atlantic crossings and now South Georgia over an 11 year period. It has been wonderful. Yaghan went through an extensive refit at the Hallberg-Rassy shipyard in 2015 in order to be in top shape for South Georgia. So she is up to date, well proven and in very good shape. Yaghan is a Hallberg-Rassy 62 delivered 2003. The hull length is 18,88 m and the beam is 5,15 m. The designer is German Frers. The displacement is 33 tons but the actual weight - with full tanks - is 40 tons. The yacht was built and equipped with a future circumnavigation in mind. Click here if you want to see Yaghans interior layout. We normally sail her on two people. That was also the case during the circumnavigation. Because you need a watch system when you do longer trips that means that the boat must be possible to sail single handed. It works thanks to the Hallberg-Rassy push button sailing concept. The first Yaghan was a Hallberg-Rassy 46 delivered in March 1998. The hull length was 14,78 m and the beam 4,40m. The displacement was 16 tons but the actual weight - as she was - was 20 tons. It was with the 46 that we got confidence in the Hallberg-Rassy push button sailing concept. If you want to read more about Hallberg-Rassy you can click here. If you want to see Yaghan in a commercial for a Spanish beer - Estrella Galicia - click here. Yaghan was the name of a tribe on the islands around Cape Horn in the old times. They were known to be very good swimmers - especially the women. Arne spent New Years Eve 1994/95 on the Cape Horn - cliff and became very fond of the place. On New Years Day 1995 he rounded the Horn on a 50 footer. The nature round the Beagle canal is very impressive with beautiful waterways surrounded by mountains that can be 1000 -1500 meters high. This experience created a wish to return to the area and to sail in the Patagonian archipelago. It also created a dream to sail to Antarctica - only 500 nautical miles south of the Horn. If you want to read an article about Arne´s rounding of Cape Horn click here. Where has Yaghan sailed before the circumnavigation? 1999 - The Faroe Islands. By clicking on the name of a route you will se a chart that will show the exact way that Yaghan sailed on each trip. To circumnavigate the globe is a dream that most blue water sailors have somewhere deep inside. We are not unique in this respect. On September 27 2005 Yaghans circumnavigation was annonced. She departed on June 1 2006 and returned home again on July 17 2009. The only crew members were Heléne and Arne. 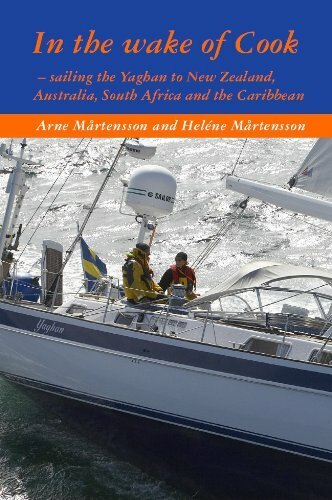 The idea of a circumnavigation became serious when Arne rounded Cape Horn on New Year 1995/96. 1997 we ordered our first real blue water cruiser - a Hallberg-Rassy 46 named Yaghan. Before that Arne had owned eight boats - most of them aimed at racing rather than cruising. By year 2000 our plans had matured so we dared to order an even bigger blue water cruiser - a Hallberg-Rassy 62. The yacht was equipped with a future circumnavigation in mind and was delievered 2003. She has extra large dieseltanks (2600 litres), extra large generator (16 kW), Internet with global coverage for communication and weatherforecasts, AIS, Transas electronic charts covering the globe and electric stove (no liquefied petroleum gas). We sailed her 12.000 nautical miles before we left Sweden and were convinced that we could not find a better boat for a circumnavigation with only two people on board. Among other things we sailed her to Iceland 2003. The circumnavigation was 44.000 nautical miles. Thats is pretty much the same distance Heléne and Arne have sailed together during the 10 years before the circumnavigation.. The route followed in the wake of James Cooks first circumnavigation with Endeavour 1768-1771 when he " discovered " Australia and New Zealand. An original chart showing Cooks first voyage is hanging in Yaghans saloon. The only difference between this route and Yaghans is that Cook never got to Antarctica. Click here if you want to see Yaghans route. The circumnavigation could be followed in Yaghans blog. Pictures are in the photo galleries - one covering Stockholm - New Zealand and the second covering New Zealand - Stockholm. Cook is unique i many ways. He was the first sailor in world history that really knew where he was. Just before Cooks first journey the 500 year old problem with sailors being able to calculate their latitude but not their longitude got two solutions. On the first journey the longitude was determined by observations of the moon - a complicated method on a ship at sea. On the second and third journey he used Harrissons clock that was just invented. This problem is not so big on a modern yacht like Yaghan with five GPS on board and electronic charts fore the entire world in three different computers. Cook was also the first sailor to cross the Antarctic Circle as he sailed south of 66,5 degrees but he never saw Antarctica. Yaghan spent two weeks in Antarctica over Christmas and New Year 2006/2007. During Cooks second voyage he became the first to circumnavigate from west to east. He sailed in the roaring forties round Antarctica. Very much the same route as the Volvo Ocean Race used to sail. That voyage took three years. At the end of the voyage in 1775 he became the first to set foot on South Georgia. He spent three days charting and claimed it for England. After that he sailed to Cape Town - the same route as Yaghan did in 2017. Only one of a crew of 118 was killed on that voyage - unique at that time. The goal to return home with the entire crew alive is of course even more important for a yacht like Yaghan with a crew of two!!! Cook is a model as a sailor and a human being. He was bold but he always tried to reduce the risks by using the best technology available. He should never have done his third voyage. His health was not good enough. Like many people in business and politics he did not have the good sence to quit in time. The purpose was to find the Northwest passage - the passage north of the American continent. He did not find it. Instead he found Hawaii where he was killed by the natives. More than 100 years later Roald Amundsen became the first to sail the Northwest Passage in 1906. The first commercial ship to sail it was Lindblad Explorer in 1984 under the command of master Hasse Nilsson. Yaghans voyages after the circumnavigation? 2011-2014 Yaghan sailed round the entire Med including Croatia, Turkey and Greece. From there she sailed to the Caribbean starting with Grenada and then visiting almost all of the islands up to British Virgin Islands. After an extensive refit at the Hallberg-Rassy shipyard 2014/2015 Yaghans was again fit for new adventures. 2016/2017 she visited South Georgia 10 years after her trip to Antarctica. South Georgia had been on our Bucket List since we visited Antarctica 2006/07. 2016/17 we did it. Click here to read an article in Swedish about the voyage. This trip - like the circumnavigation - followed in the wake of James Cook. He was the first to set foot on South Georgia in 1775 on his second voyage. He spent three days charting it and he claimed it for England. He also left it for Cape Town as we did in 2017. South Georgia is much more difficult than Antarctica for a number of reasons. The winds are stronger. The reason is that South Georgia is north of the regular lows passing through Drake Passage. Antarctica is south. And the winds are always stronger on the north side of a low in the southern hemisfer. The 3000 meter mountains in South Georgia also create case winds that enhance the already strong winds at sea. If it blows 30 knots outside it can be 60 knots at an anchorage in South Georgia. And the better the anchorage looks on paper the worse it is. When you go from one anchorage to another in South Georgia you have to sail in open waters. In Antarctica around the peninsula there is a relatively protected archipelago. However the most difficult thing with South Georgia is to leave. Between the Antarctic peninsula and Ushuaia you have 600 nm. That is 3 days for Yaghan. And for three days you can make a very reliable weather forecast. To South Georgia from the Falklands it is 800 nm and for that distance it is also possible to have a reliable forecast. However when you leave South Georgia the only realistic leg is to go to Cape Town. Cape Town is 3000 nm away or 15 days for Yaghan. For 15 days there or no such thing as a reliable weather forecast. Therefore you have to deal with the weather you get en route. That means that you are likely encounter 1-3 heavy full blown storms. We had one storm of 60+ knots and a significant wave hight of 7 meters. That means that the highest waves are 14 meters. Everything else we have experienced during 125.000 nm with Yaghan is ” a walk in the park” compared to the voyage from South Georgia to Cape Town. Since 2016 it is also - for good reasons - very difficult to get permission to sail to South Georgia. A lot of things have happened over the years and the government of Falklands now have very high demands on yachts that want to go there. Yaghan got permit number 1 under the new regulations and we were the only private ( non commercial ) yacht to go there that season. Apart from these problems South Georgia is a fantastic place with an interesting history. The animal life is outstanding with 65 million birds and 5 million seals. There are a lot of scandinavian and swedish connections. The first Swedish Antarctic expedition 1901 had a ship called ” Antarctica”. Captain was CA Larsen. He found Grytviken and gave it its name. Later he founded a whaling station here and he became a rich man on that business. The scandinavian influence is seen everywhere in South Georgia. Schackletons grave is also here. His epic voyage from Elehant Island in Antarctica to South Georgia in a small lifeboat ” James Caird ” will always be remembered as the most fantastic voyage in the history of sailing. 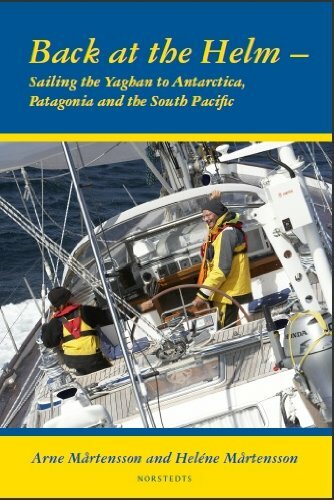 To sail to South Georgia ( and leave ) is probably among the most demanding things you can do as a sailor. Click here to see 4 movies from the voyage. Good weather information is of vital importance when you sail the oceans.The most important element in Yaghans weather service is the weather program SPOS. SPOS is used by merchant vessels all over the world. You can get weather charts for any part of the globe. You enter your own speed diagram into the model and the program creates the most optimal route.